Taylor Swift and Calvin Harris are a thing that is happening so BUY A TICKET OR GET OFF THE TRAIN. It began, as all things do, with the pair wearing matching outfits to a Whole Foods in Nashville. Slightly damning, but there's nothing confirming there. Maybe they're friends. Maybe they ran into each other. Maybe Taylor turned to look at the DJ because she thought he was a mirror and wanted to know how her grey t-shirt looked. Taylor and Calvin—supposedly just WHOLE FOODS BUDDIES—were later spotted holding hands at a Kenny Chesney concert. Kenny Chesney? Hands? If that's not freaky foreplay then I don't know what is. 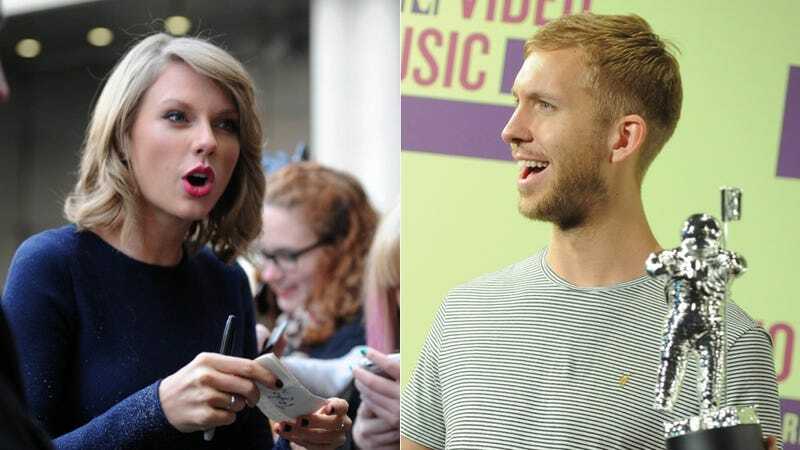 TMZ also unearthed a video of Calvin from November in which he told radio DJs that he, in the world of celebrity Tinder, would swipe left on Taylor. Whoa. Yeah. Whoa. Hey guys: Do you think people can ever escape true loneliness or nah?